Nobody wants to hear these words: “The surgery is really, really painful, but the rehab is even worse.” And that is exactly what everyone was telling me this past spring when I had rotator cuff surgery caused by a college football injury plus a lifetime of active living. When I came out of surgery, the doctor shared that this was the worst rotator cuff tear that he had seen during his 30 years of surgery, and he reminded me that rehab was going to be very, very challenging. Dr. Clinton Longenecker, center, posed for a photo with Dr. Mike Travis and Deborah Rohloff. So with this background, I walked in to the UT Medical Center Outpatient Rehabilitation Services in early summer with a certain level of apprehension and excitement to get started with my rehab to bring back the use of my right shoulder and arm. Now as a business professor for the past 30 years who studies organizations for a living, I can state with great confidence that excellent organizations tend to be few and far between. Some of the characteristics of excellent enterprises include exceptional care and concern for clients/customers; the use of cutting-edge technology and best practices in delivering services; passionate and dedicated professionals; teamwork and a positive organizational culture; and a willingness to go the extra mile. Well, based on my recent experience, I have to tell you that our UTMC Outpatient Rehabilitation Services is an excellent organization and demonstrates these attributes day in and day out in performing its invaluable mission of helping thousands of people heal and get healthy. Several years ago, I had Marci Cancic-Frey, director of therapy services, as an MBA student, and I was always impressed with her passion and enthusiasm as she talked about the quality of our physical therapy services and the exceptional people that she works with. She always said, “Our people are truly dedicated to our patients in delivering exceptional PT services and helping people get well … I truly love my job.” So, needless to say, my expectations were very high going into this experience, and her organization did not disappoint. When you walk in the door, you are warmly greeted by Sheila Burk or Lakisha Carter or Shannon Walker or Chantel Carter, and you sit in a very comfortable waiting room. The therapy staff is exceptionally punctual, and not one time in my 40 trips to therapy was my therapist ever late or running behind schedule, and they were always sensitive to my time. When your therapist approaches you to walk you back to therapy, you are always greeted with a smile and encouraging words, and their energy is contagious. Our physical therapists use a team-based approach to ensure an effective assessment, a best practices treatment plan that is known and understood by everyone (including me, the patient), and therapy sessions that are designed to help the patient learn, practice and master the necessary exercises to speed recovery. I was also very impressed with the fact that their goal is to schedule treatments in a time frame that was most convenient for me as the patient; this included thoughtful text message reminders of upcoming therapy sessions. 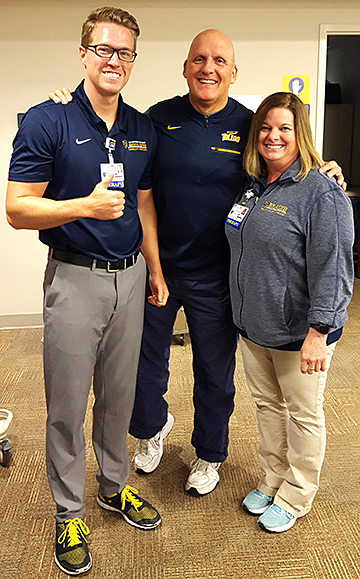 My therapy team included Dr. Mike Travis, physical therapist, and Deborah Rohloff, physical therapy assistant, with support from Alyssa Nino and Kayla Pickard, physical therapy assistants. Each of these professionals had a passion for their work, patient sensitivity, and a willingness to inspire me to push myself during our therapy sessions while at the same time encouraging me to do my exercise homework. And as you look around the therapy room, you see this philosophy at every turn as our terrific UTMC therapists might be helping a high school athlete come back from a knee injury or a person with severe head trauma learn how to walk again and everything in between. These great professionals became friends as they help me in so many ways, and I’m thankful and proud to know that we are all part of this terrific institution. I have to say that our UTMC Outpatient Rehabilitation Services, from this patient’s perspective, is simply excellent at the life-changing work that they perform every single day. A special thanks for helping me and countless others. Go UTMC Rockets! Longenecker is a Distinguished University Professor and director of the Center for Leadership and Organizational Excellence in the College of Business and Innovation. For college students, spring break is generally a time to party, hang out with friends, or catch up on sleep. However, these typical activities did not entice me: I wanted to do something bigger and more meaningful. During my junior year, I studied abroad in Ghana and realized my love for traveling as well as helping others. While there, I worked at a small non-government organization called the Mawulolo Youth Network, an after-school program, where I taught first- and second-graders math and English. UT students posed for a photo outside the library they painted in a small mountain village in Guatemala. 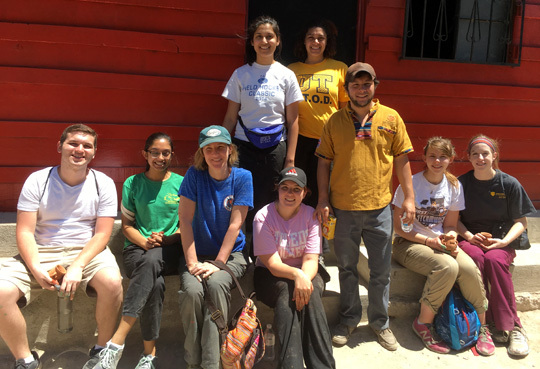 They are, from left standing, Megh Kumar; Carlee Vaughn; and Manuel Martinez, a guide from International Samaritan, the organization that assisted with the trip; and, seated from left, Seth Hasler; Sarah Jaggernauth; Dr. Ashley Pryor, associate professor in the Jesup Scott Honors College; Ashley Diel; Allison Grim; and Elizabeth Russell. I quickly began to see how different other countries were from the United States, especially in the case of education, or rather the lack of its availability to children in other parts of the world. Since then, I have made it my personal mission to travel to places others in the United States generally do not go to such as throughout Africa and the Middle East to see how others live as well as to learn about the accessibility to education. With this mindset, I knew I wanted to make my senior year spring break memorable by continuing working in a community in another country to help lessen the gap between education and accessibility. Last year for spring break, I traveled to Nicaragua with the Jesup Scott Honors College and worked in a school helping to build a library. I saw it only fitting that I travel with the college again this year, but this time to Guatemala. 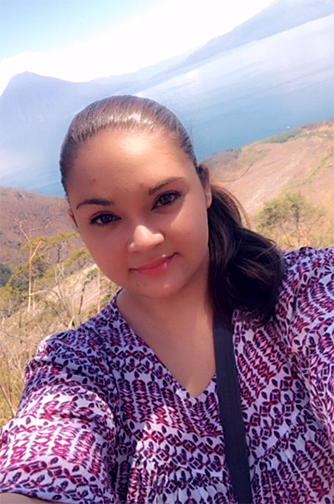 Ashley Diel took this photo in Guatemala from Cerro de la Cruz looking over the city of Antigua with Agua Volcano in the background. There were seven honors students going on the trip. I was fortunate to know a few of them who had gone to Nicaragua with me last year, but by the end of the trip, all of us had become good friends. 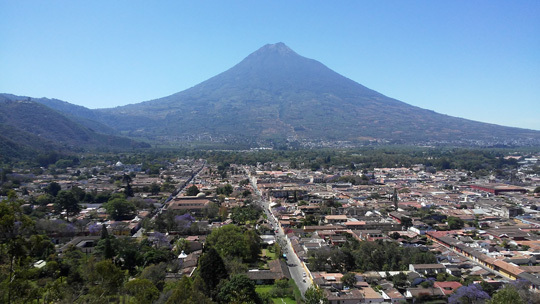 For our first day in Guatemala, we traveled around the city of San Juan, as well as Antigua. This was meant to show us the country and let us learn a little about its culture. We learned about the importance of jade in Guatemala dating back to the times of the Mayans, as well as traveled to see an active volcano. The country was beautiful, and the views were breath-taking. However, we were not there to vacation. We were there to work. For the rest of the week, we spent time in a small community in the mountains. Getting there was an adventure as we had to drive down winding hills that made it feel like we were at Cedar Point. We had two main projects that we worked on in the community. We painted the inside and outside of a small library for the children, and we started building the foundation of a house for a local family. While I have painted many times, I cannot say that I have ever had to do construction, and it gave me a new appreciation for the people who do it for a living. The group of us dug trenches with pick axes for days as the community did not have access to machinery to do the digging. Many of us quickly formed blisters, but we kept at it knowing that a little bit of pain on our behalf was worth it if we were able to help the people there. As we worked, some of the local children would come up to us, interested in what we were doing. Unfortunately, my Spanish is not very good, so I was unable to communicate with them, but several other students on the trip were fluent and spoke with the kids. It was amazing to see my fellow UT students interacting with the kids and connecting with some of the adults in the community. Since the kids did not know English, one of the students in my group wrote down a bunch of words for them so that they could begin learning. As the week came to a close, I could see just how much we had accomplished. It was amazing to see how much we had painted, but even more impressive was how much of the foundation for the house we had finished. In one week, we went from not having broken ground to trenches that were several feet deep and beginning to lay the cinder blocks for the walls. 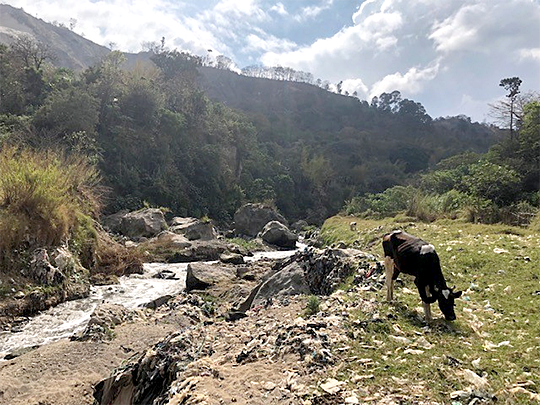 While we all had a great time in Guatemala working and experiencing the culture, it was even more rewarding knowing we had made at least a little difference in the lives of those who live there. I believe I can speak for everyone who went on the trip and say we all felt a sense of pride in what we had been able to accomplish. I am sure we all wished we could stay longer than a week, especially so that we could see the house being built through the end. 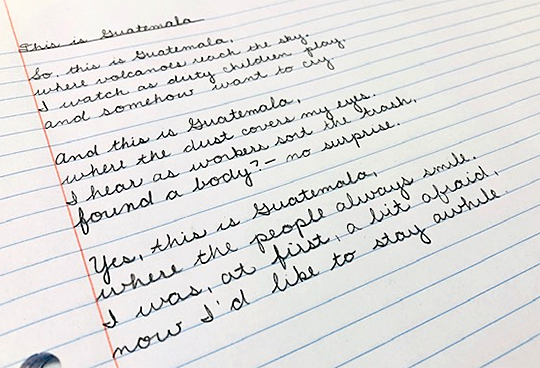 Saying goodbye to Guatemala was hard, as it always is with any country that I visit. 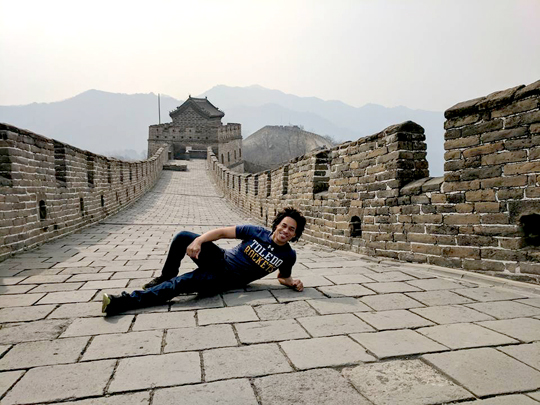 However, I know that it will not be my last time traveling or volunteering abroad. There are still so many new and exciting opportunities out there, and I plan to keep going everywhere I can and trying to make a difference. Diel is a senior majoring in communication and a student in the Jesup Scott Honors College. She will graduate in May. I teach astronomy at The University of Toledo, and I’m known as “Prof. B.” My job is part technical and part inspirational. The excitement of the recent, historic solar eclipse touched hearts and sparked the imaginations of generations of families across the country who crowded streets to witness something powerful in the universe. Here at UT’s Ritter Planetarium and Brooks Observatory, we also are planning to celebrate a major milestone and are in need of the public’s help to share our rich history of education, outreach and celestial exploration. 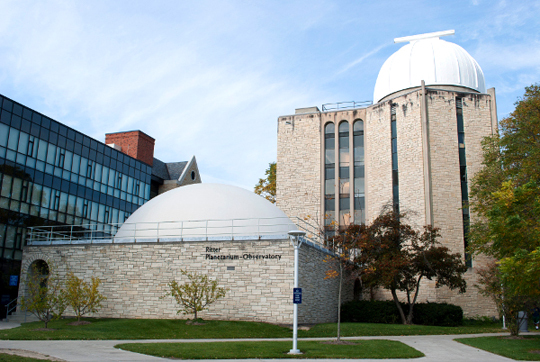 Friday, Oct. 13, will mark the 50th anniversary of the University’s astronomy program, Ritter Planetarium and Brooks Observatory. We’re in search of your stories and memories to better tell our story. Ritter Planetarium and Brooks Observatory will celebrate their 50th anniversary Friday, Oct. 13. As a child, my first visit to a planetarium involved marveling at one of the old “star ball” projectors, but since then I have enjoyed being transported to black holes and other worlds with increasingly beautiful full-dome movies. These visits certainly had an impact on me, for I went on to earn my doctorate in astronomy. The Ritter Planetarium and Brooks Observatory are woven into the tapestry of this region. What do you remember from your visit? In the 1920s, astronomy courses were offered through the Math Department at UT, so Professor Helen Brooks would bring students to her house to look through her personal telescope. The Ritter facility was dedicated Oct. 13, 1967, with Brooks as the first planetarium director. The Brooks Observatory located in the dome on top of McMaster Hall was later named in honor of Brooks and her late husband, Elgin. The 1-meter-diameter telescope housed on top of the Ritter building is the largest optical telescope in the United States east of the Mississippi River. 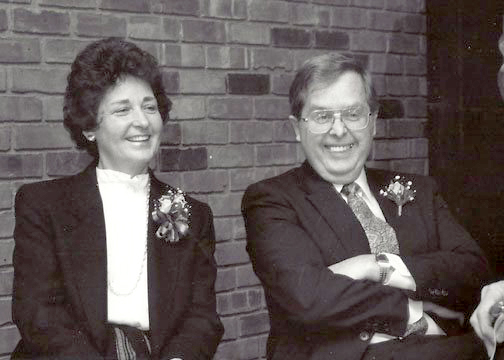 The Ritter facility was deliberately planned to blend research and public education for the University, local schools and the community. One of the joys of astronomy is that people are inherently curious about it, and so sharing our research and our telescopes with the community have been vital in our mission from the beginning. Helen Brooks died in 2011, two years before I came to Toledo. I never had the chance to meet her, but some of you did. I would like to learn more about your experiences. Did you attend any of the special events, such as for Apollo 11 and the impact of the Shoemaker-Levy Comet on Jupiter? Have you taken your family to experience programs in the planetarium or public viewings with telescopes in the observatories? Additionally, with your permission, I would like to share your stories through a poster presentation at the Astronomy Open House at Ritter Planetarium Thursday, Oct. 26, to show the strong connection this community has for astronomy. Please send your stories to me via email at jillian.bornak@utoledo.edu or mail a letter to The University of Toledo Department of Physics and Astronomy at Mail Stop 111, 2801 W. Bancroft St., Toledo, OH 43606. I look forward to reading your stories. Keep looking up! Bornak is an associate lecturer in the Physics and Astronomy Department and chair of the UT Astronomy 50th Anniversary Committee. 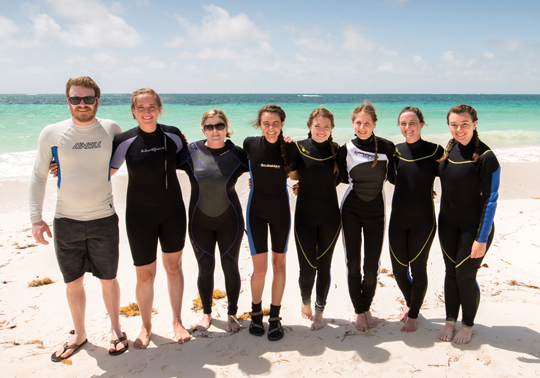 Last month, our Ecology Field Study class traveled to the Bahamas to examine coral reef ecosystems. 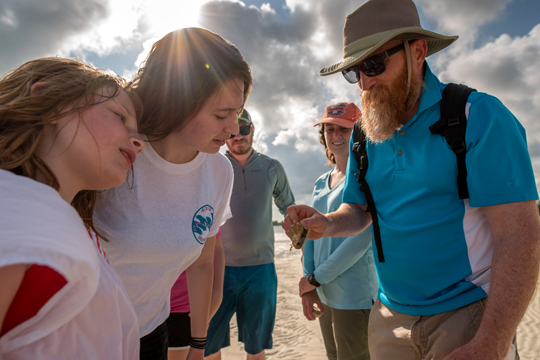 There were nine excited students on the learning excursion led by Dr. Tom Bridgeman, professor of environmental sciences, and Dr. John Turner, professor of physiology and pharmacology. Coconut palms and tropical Abaco pines resembling Dr. Seuss’ truffula trees filled the gaps between the three houses rented for our research team. The cottage I stayed in is everything one might imagine a beach house should be. Conch shells line the sandy path toward the blue water. The beach sits not even 20 feet from the house and stretches for miles in both directions. The soft white sand is finer than any Floridian beach I have ever been to, and there are no other people in sight. The crystal blue water is mesmerizing. Students in the Ecology Field Study class posed for a photo on the beach on Great Abaco Island. They are, from left, Matthew Bender, Sarah Carter, Wendy Stevens, Bianca Caniglia, Jordan Penkava, Jessica Duez, Katie Condon and Brittany Layden. Dr. Rick Francis, director of research advancement and information systems, also a member of the class, shot photos and video during the trip. 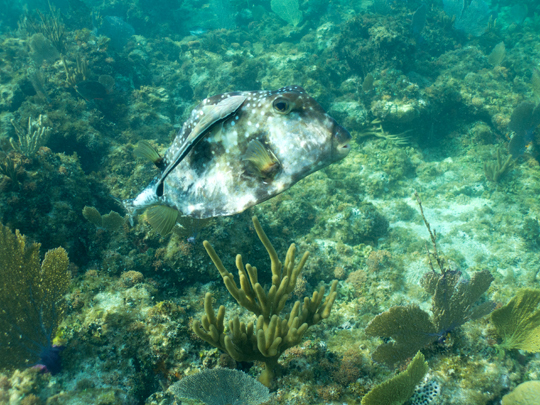 For our first snorkel, Dr. Turner took us to a private beach access point called Mermaid Reef. The water was warm (78 degrees maybe) and does not require the use of wet suits or weights. Mermaid Reef is a calm, clear location ripe with parrotfish (of various species), queen angelfish, and swarms of sergeant majors. We saw a few spiny lobsters hiding beneath the smaller reef shelves. If it weren’t for their long antennae protruding from the rock, we might not have even noticed they were there. Blue tangs (Dory fish), schools of yellowtail snappers, and a few shy squirrel fish swam to try to hide from us along the reef sides. After a few hours, everyone was hungry, and we left the site to stock up on groceries, make lunch, and recharge. After lunch, we head out to a patch reef just beyond the beachfront cottages we’re staying in. Most of the students swam out in a small school. Some of us paddled out on a small zodiac boat a few hundred yards out into the blue. I am nervous. I don’t like to admit that I am afraid of anything, but I am eager to see my first reef shark, so I scan the horizon looking for any gray triangles breaking the surface. I’ve been fascinated and fearful of sharks for the better part of two decades. However, I know that I have greater odds of dying by a cow tipping over on me or possibly getting struck by lightning. Despite my fears, I plunge into the ocean with the others. 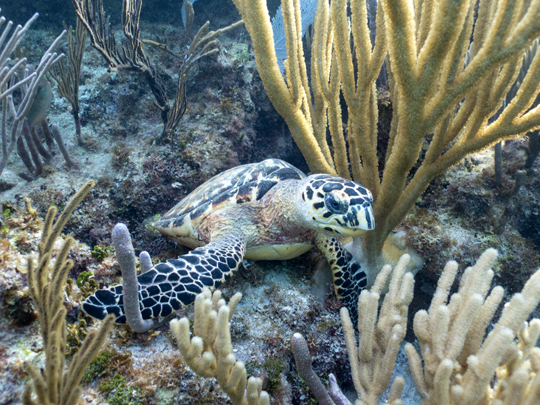 A hawksbill sea turtle hiding on the patch reef was spotted on the first day of the trip. Enormous purple sea fans, rusty-orange sponges, and sea kelp cover the live rock. The top of the reef is only a foot or two below the surface, and I find myself being pushed and pulled gently by the waves. I am trying — and failing — not to go directly atop the reef. Meanwhile, my fins are killing the tops of my feet. I swim toward the others so I don’t feel exposed or alone. After about 10 minutes, the paranoia subsides. I calmly start to visually scan every nook and cranny I see. There are so many things moving in and out of the little coral reef niches that I have a hard time focusing on any single fan or fish. Then I see it! A mottled oval with two eyes, but I am unsure. I intently stare at the reef until the outline of a shell and flippers emerge from its camouflage. I burst toward the surface and shout “Sea turtle!” It wasn’t actively swimming, just sitting there patiently waiting for us to leave, I imagine. It wasn’t unusually large or small, but it is hard to gauge size and distance underwater. That hawksbill sea turtle made the first day of our trip very special. Students snorkeled at Mermaid Reef. After a late dinner, the whole team gathered to record all the species of fish that we could confirm we saw throughout the day. I think there were close to 20 different fish recorded. We projected some of Dr. Rick Francis’ pictures onto a large white sheet for all to see. On the second day, Dr. Turner and Dr. Bridgeman coordinated an exciting boat day. We had to organize our gear and leave early in the morning to meet our captain and guide. Tim is an islander whose family originally settled on Great Abaco Island back in the 1600s. He told me he was a professional fisherman who fishes for mahi mahi (dolphin fish), red snapper and spiny lobsters. However, that day he was taking us to some special reef sites: Snake Key, a national Abaco-protected marine reserve, as well as an open-ocean drop with gorgeous reef wall. We boarded around 9 a.m. and motored out a few miles away to the first location, a historical shipping channel. The shipping channel, otherwise known as Snake Key, has a fast current. The plan was for Tim to drop us off far upstream and allow us to drift to a pickup site farther downstream. The channel wall had some nice corals and a few spiny lobsters, but the quick current made it challenging to photograph. Tim picked us up and then drove us back upstream to do it again. There were some large rays that were seen from the boat — a few outlines and shadows moving under the surface and away from the boat. Dr. Tom Bridgeman examined a live conch with, from left, daughter Mirabel Bridgeman and students Jordan Penkava, Matthew Bender and Katie Condon. After that, we trolled along the waters of the key. There were small mangrove islands and many rocky, seemingly uninhabited mini-tree isles all around us. The water was crystal clear and shallow. I saw cushion sea stars (starfish) from the boat and sea turtle shadows darting away from our path. We stopped the boat atop a blue hole, where the shallows disappeared and a deep dark hole (which I chose to avoid) was located. Rick launched his remote-controlled camera drone to get aerial footage of our snorkeling. I think most of us were betting on spotting sea turtles, but instead I mostly saw only sea cucumbers. Once all the students were back on board, we headed out into the blue toward the protected marine preserve. As we navigated toward the site, I became awestruck with how the ocean changed color. Growing up and around Lake Erie for most my life, I have never seen so many shades of blue in a single body of water. It turns from teal to clear, then aquamarine to a deep blue and then back to teal again; it was breathtakingly beautiful. 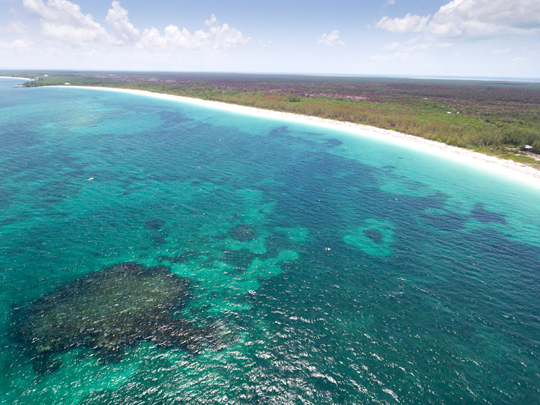 Dr. Rick Francis took an aerial shot by quadcopter of the patch reef. 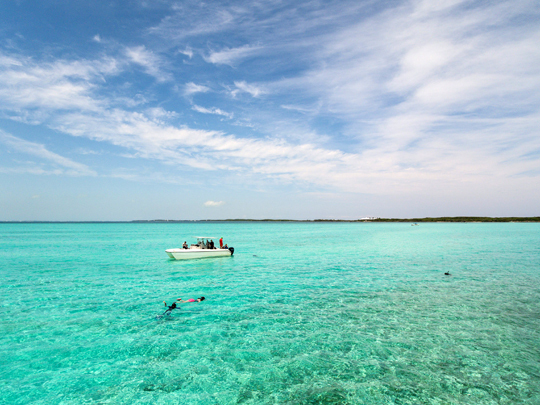 As we approached the Pelican Cay marina park, I noticed a couple other boats had snorkelers in the water. Dr. Turner told us where to head once we were in the water. He prefaced our swim with descriptions of large elkhorn and staghorn corals, and Tim reassured us that if we were in any distress to wave to him and he would bring the boat to pick us up. Here the water was nearly true blue, and I definitely could not see the bottom. When I finally got my mask to seal tight and put my face down, I saw a great expanse of coral and life that I could only describe as an endless reef filled with color and fish everywhere! The fish were so numerous and the mass of reef so long that I became somewhat disoriented underwater as my eyes tried to adjust focus. I don’t remember how long we were in the water here, but I could have stayed much longer. I was most excited to see my first French angelfish! It was so pretty, its grayish body covered in bright yellow scales. I have yet to see another one, but I don’t think I will ever forget how gracefully it moved below me. I tried to free-dive down for a better look, but I was far too buoyant to get any closer than about 4 feet. Additionally, I saw a chubby porcupine fish (puffer) hovering at the reef’s edge nearer to the bottom. He wasn’t inflated; to me, he seemed kind of adorable, doe-eyed with a big ol’ mouth. But it was the elkhorn coral that took my breath away. I never thought I would get to see a coral reef the way it looks in my dreams. Its color and vastness were overwhelming, spiritually uplifting, and magical. I have to go back there — before it disappears forever. 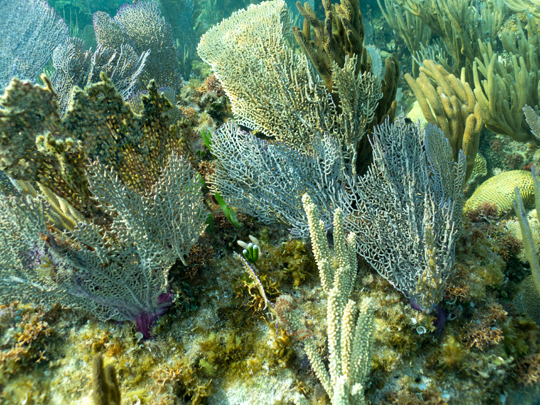 Various sea fans were seen on the coral reefs. By the time the last snorkel site of the day, I was exhausted. The open-ocean drop-off was a destination I knew we were going to get to snorkel, but I didn’t realize we were going to see so many locations in a single day. I counted eight snorkel drops in six hours. My back, ankles and arms were sore, and I really did not want to wear my wetsuit any longer, so I removed it thinking I was done. Little did I know that we were about to snorkel the largest wall of coral imaginable. The first one in the water was Brittany Layden; within minutes, she came to the surface and said, “I just saw a barracuda!” It didn’t take long for everyone else to grab their gear and jump into the dark water. I asked Dr. Turner if we would see another site like this on the trip, he said, “No,” and I realized I had to go in. Students also saw this spotted trunkfish with a remora hitching a ride. Putting a wet wetsuit on after it has already been removed is an exhausting task in itself. The tops of my feet were raw from my fins. I decided to take the chance and go in unprotected and with only my mask and snorkel. It was an opportunity that I wasn’t sure I would ever get again, so I went in. By the time I got in, the barracuda had disappeared into the blue. I swam over to the others and saw an even larger reef wall than in Pelican Cay. It was easily 50 feet tall, and I could see all the way to the bottom. I quickly scanned the water surrounding me for jellyfish because I didn’t want to get stung. I looked down and saw a spotted trunkfish and tried to get the attention of Dr. Bridgeman or Rick who were filming underwater. Swimming alongside the great wall of coral, we spooked a sea turtle, which quickly darted up and over the reef out of sight. Myself and a few others followed, but without fins I was slower and clumsier in the water. As I continued to try and keep up, I spotted a Nassau grouper 30 feet below me. Whenever I spotted a new species, I tried to get the other’s attention so they could see it, too. However, trying to talk with a snorkel in your mouth is impossible, and half the time I’d surface and everyone else still had their heads down. I carried on nonetheless. After about 20 minutes, I was done — out of breath, out of the water, and heading back to the dock. This day was going to be impossible to top. A couple other students managed to see the outline of a shark, but they were too far away to make a positive ID. I had hoped to see a shark and yet felt completely satisfied having not seen one. It was a remarkable experience learning in the ocean. Stevens graduated in May with a bachelor of science degree in environmental science. Several years ago, I started noticing a pattern of wherever I went, I was being approached by people who were struggling in their working relationships with their bosses. We all know that our bosses can impact our work lives in immeasurable ways. Working for a great boss can make going to work a great and rewarding experience. Conversely, working for a bad boss can be a nightmare and can create big trouble. So here’s a simple truth: The stronger our working relationship with our boss, the greater the likelihood of high performance and career success. In previous research, I found that bad bosses come in a wide variety of types that include bosses who are egomaniacs, emotionally unintelligent, non-communicative, clueless, unrealistic, indecisive, mean-spirited and unscrupulous, just to name a few. Lesson #1: Accept the fact that you cannot change your boss. This is reality, not fatalistic. Each of us must adjust and adopt our own behavior to accommodate to the shortcomings and tendencies of our superiors as we are generally not in a position to change their behavior. To be successful, we must effectively adjust our style and approach to work to accommodate our boss’ style and shortcomings. Lesson #2: Put yourself in your boss’ shoes. It is imperative to understand your boss’s performance goals and what your organization expects your boss to deliver. Understanding what your boss is up against can provide you with important insight into his or her behavior. Work hard to know and understand what your boss is being paid to deliver and the pressures that she or he is under from her or his superior. Lesson #3: Get on the same page with your boss. Once you know what your boss is being held accountable for, it is your job to get on the same page with your boss and identify the results that are needed to deliver to help your boss be successful! We must proactively realign our goals, roles and responsibilities with our boss to make sure that we are operating in concert with them. Lesson #4: Work hard to know and understand your boss’ strengths and weaknesses. You and your boss are linked together, so it is really important to pay attention to his or her work habits, management style, and how he or she operates on a daily basis. Failing to know and understand your boss puts you at a disadvantage when developing strategies that will allow you to both play to his or her strengths and deal with shortcomings. Always know your boss’ strengths, weaknesses and idiosyncrasies. Lesson #5: Regularly assess the overall quality of your current relationship with your boss and determine strengths, weaknesses and opportunities. Taking the time to understand what is working well and what needs work is an important tactical step to identify the things that you need to do to better manage your boss. This assessment will put you in a better position to develop a game plan for improving your working relationship, and it is your responsibility to do so. Lesson #6: Communicate using your boss’s rules. Learn how and when to communicate with your boss and how to best keep him or her informed. Know and understand your boss’s communication habits and practices, and do your best to communicate with her or him on her or his terms. Lesson #7: Be proactive and keep aligned. Take the initiative to schedule regular alignment meetings with your boss to review and prioritize your current workload. Meet with him or her so he or she can provide you with input and feedback on your performance. Regular alignment sessions keep you on the same page and create opportunity to keep our bosses coaching and providing us with the information we need for success. Lesson #8: Establish your brand and make it a practice to under-promise and over-deliver. Knowing and understanding how people at work, including your boss, perceive you is an important part of managing your relationship with your boss. Along the same lines, make it a practice to under-promise and over-deliver. Be known as a person who is easy to work with and who consistently delivers desired results. Lesson #9: Be a problem-solver. Most of our bosses have a fair number of problems and issues on their plates, so when you do need to bring something to their attention, use your knowledge of your boss’s modus operandi to decide on the best time and place to do so. When approaching him or her, make sure that you properly frame the issue to make it easier for your boss to understand the problem. Then, take the time to offer up your ideas or your potential solution(s) to the difficulty. Be known by your boss as a person who is problem-solver. Lesson #10: Show respect for your boss even if he or she might not deserve it. When you work for a bad boss, it is important to remember that this bad relationship is not taking place in a vacuum. Always show respect for your boss, and do not engage in gossip, backbiting, character assassination, or making your boss look bad behind his or her back. When word of bad-mannered behavior gets back to the boss, it can spell career disaster for the backstabber. Demonstrate respect for your boss regardless of how bad she or he might be and resist the temptation to undermine that person. Lesson #11: Know when it’s time to go. Our final lesson circles back to our first: It is important to remember that there’s actually very little that you can do to change your boss. So if your boss has a destructive personality, or is openly disrespectful of you, or is damaging your performance, or is engaged in unscrupulous or illegal activities, you may need to remove yourself quickly. When your boss is performing in a fashion that makes work untenable, develop and execute your exit strategy ASAP. Regardless of the type of boss you work for, I want to encourage each of you to think through these important lessons that can make life easier and put you in a better position to deliver desired results, which is the cornerstone of career success. Longenecker is the Distinguished University Professor of Management and director of the Center for Leadership and Organizational Excellence. The study he and Dr. Laurence Fink, UT professor of management, conducted is titled “Serious Lessons for Managing Your Boss in the 21st Century,” which was published in a recent issue of Industrial Management. Well, here we are at the start of another school year filled with excitement, hope, energy, and an opportunity to make a real difference in the world with our hallowed profession! I was recently asked by Interim Provost John Barrett and his staff to facilitate a mini-workshop on teaching for the New Faculty Orientation Program. As part of the program, we did a group exercise with UT’s 80-plus new faculty on “The Attributes of the Best Class You Ever Experienced.” Our new faculty members described their experiences, shared those with each other, and coached each other on what to do to provide our students with awesome learning experiences. It was truly inspiring to hear faculty discuss how great teachers had changed and transformed their lives! I know that teaching is sometimes underappreciated, but I was reminded by my new colleagues that teaching has the potential to change and transform people’s lives, which is a noble calling indeed. As teachers, it’s easy to focus most of our time and energy on the “information” associated with our various courses. But we have found in our adult learning research that information is simply the foundation for great teaching. Game-changing teachers focus on providing great information in their courses for sure. But great teachers also create a learning climate for student motivation, idea integration and career application to help their students experience real transformation. So going into this new school year, here are some of the most important things that we can do to provide our students with transformational experiences. Our students deserve cutting-edge information and knowledge, but let’s remember to use our platform to help transform our students. Our students connect with our passion and mojo. The overarching factor for transforming students is bringing our passion, excitement, expertise and enthusiasm to each and every exchange we have with them. They can tell pretty quickly if we’ve “got mojo” for them and for what we are teaching. This single factor plays a dominant role in our ability to motivate and impact our students. Our students want and need the “big career/skill” picture. The best teachers create relevance and idea integration. Regardless of the subject we teach, it is imperative to ground each class with a clear and concise explanation of how this class will benefit the students’ career preparation. Whether it is course content, specific skills that will be acquired, people they will meet, or practices to be mastered, it is important that we give students a strategic view of how each class will help them achieve their career aspirations. As the semester unfolds, we need to constantly illustrate how our material ties back to their career success. This simple act can have a powerful effect on a student’s motivation and commitment. Our students want and need learning structure and clear expectations. We should never underestimate the importance of being organized and in communicating our course schedule and expectations on an ongoing basis. We want our students to know exactly what is coming and when to help them plan and organize. Let’s make it easy for students to work hard and learn. Many of us have found that it is very useful to create a course-learning contract. This document outlines the behaviors and challenging expectations that our students can expect of us and that we can expect of them. The best teachers challenge their students to be the best they can be! Our students want access to us and need us to connect with them at a personal level. It is said that “people care how much you care before they care how much you know,” which is true in any discussion of great teachers. So there is no substitute for establishing, communicating, keeping, inviting and welcoming students to make use of office hours. The simple act of being accessible to our students can carry great weight in letting our students know we care for them and are there to answer questions and provide career counsel. Students also greatly appreciate it when we know their names. Now in big classes, this can be very difficult, but nametags, name placards or using technology to memorize student’s names can all send a powerful message that we care about them as people. Our students want and need active hands-on learning and engagement. In every discipline, there is a time and a place for straight one-way lecture teaching. But research continues to show that real learning and transformation requires student engagement and active learning. In putting together each class, ask yourself, “What can I do to encourage student involvement, ownership and excitement around the material, foster dialogue and discussion, and build energy and enthusiasm into the session? The good news is there are lots a ways to do this and lots of people on campus to help us if we are serious about becoming better transformers. 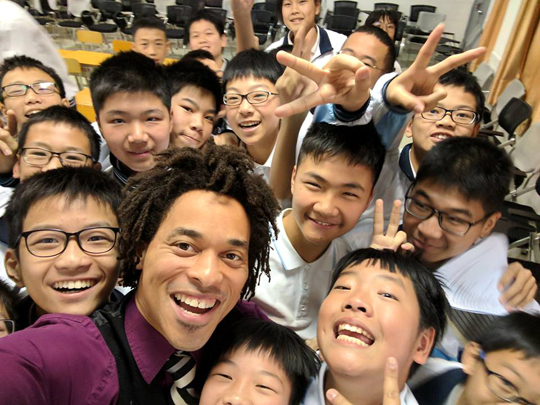 Our students want class to be fun, and maybe even entertaining, regardless of discipline. Focusing our efforts to create student motivation, integration and application of material is critical. So here’s a thought: Instead of going into this new school year thinking of ourselves as teachers, instructors or professors, consider redefining your role to that of a transformer. A decade ago, I redefined my role as that of a transformer and it has caused me to approach teaching very differently. And as a transformer, I’m always looking for new ideas on how to improve my teaching talent, so I hope you don’t mind me sharing these thoughts. Transforming our students just might be one of the more important activities that you and I ever participate during our lives. And as a University of Toledo alumnus, I am very fortunate to have been transformed by the great teachers who taught me. Have an awesome school year! And never underestimate the transformational power you possess! Longenecker is a Distinguished University Professor of Management and director of the Center for Leadership and Organizational Excellence in the College of Business and Innovation. He received a bachelor’s degree in business administration and a master of business administration degree from UT in 1977 and 1978, respectively. Send your thoughts and suggestions to clinton.longenecker@utoledo.edu. There’s just something about improbability and coincidence that leads to the best stories. The Holy Toledo! 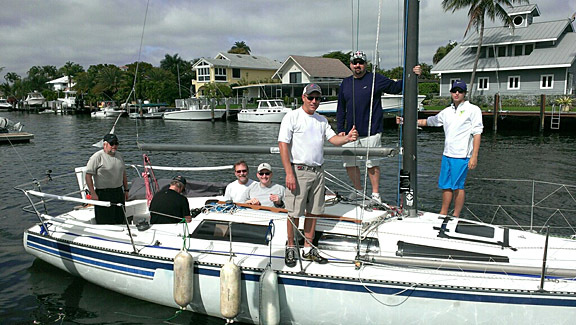 crew, from left, Clif Vaughan, Tom Andrews, Al Newell, Steve Morrow, George Sipel, Daniel Miller and Luke Gossman leave the docks of the Ft. Lauderdale Yacht Club for the start of the Ft. Lauderdale to Key West Race Jan. 14. Four years ago, I was introduced to the world of competitive sailboat racing through some good friends at the Center for Creative Instruction (CCI) on Health Science Campus, and it immediately became a labor of love. So, when I’m not making pictures as UT’s photographer, I’d rather be out sailing. Especially in the middle of winter. In January, I had the incredible opportunity to indulge and join an all-star crew, racing a yacht named The Holy Toledo! in the Ft. Lauderdale to Key West Race. The 40th iteration of the offshore ocean race attracted participants from such far-reaching places as Texas and Rhode Island and even included a brand new 88-foot state-of-the-art carbon fiber super yacht among the competitors. Quite a daunting prospect for a relative beginner like myself, but the 70-degree temperatures of Florida in winter did sound pretty good, so I told the rest of the crew to count me in. Hot on the heels of the Rockets’ victory in the GoDaddy Bowl, we hit the road with the sailboat in tow. So far I’ve written about the race, but not the crew. I have to confess how surprised I was to find out how much sailing talent we have here on Lake Erie and at the University. 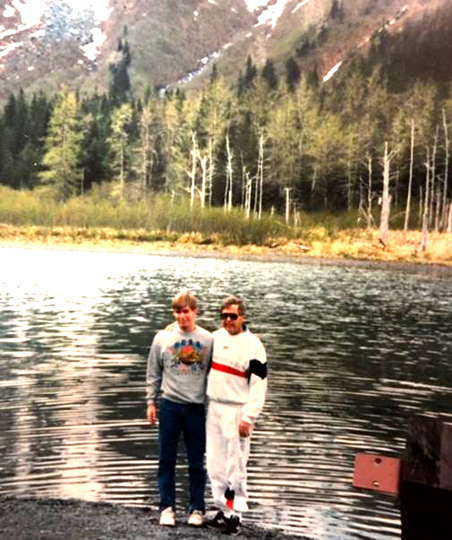 Two of the boat’s owners, Tom Andrews, a UT alumnus and one of the founders of CCI, and Clif Vaughan, UT alumnus and husband of Bobbi Vaughan, the current CCI director, have decades of sailing experience and have won more races than they can count. (I’m guessing that means the real number is more than 10 apiece.) We also had the privilege of counting UT engineering student Luke Gossman as one of the crew. Luke is a member of the UT Sailing Club that won accolades at the Intercollegiate Offshore Regatta, earning the right to compete in the 47th EDHEC Sailing Cup in La Rochelle, France, this April. Clearly, I was in good company and by far the least experienced sailor onboard. No pressure. Misty Matter and Al Newell posed with Key West Police Officer Bob Bulnes on the shoulder of Florida State Road A1A in Key West Jan. 17. I’ll risk being anticlimactic in saying that the race went very well for us and hope it’s not overly hokey to report that we had “fair winds and following seas.” It was a great sail and The Holy Toledo! finished first in her class, ahead of seven other boats, with a time of 23:51:39. No trip is complete without some interesting stories, so this is where the aforementioned coincidence comes in. The night after docking in Key West, I was doing some “sight seeing” at an establishment of local color, as sailors do, and found some crew from another boat that belongs to the same yacht club as ours. As we were exchanging congratulations, I mentioned my position at UT and the boat owner’s son got really excited, saying that his father just had to meet me. It turns out that they were Bill Bollin and his son, John, and were huge UT supporters. Even more unlikely, Bill was on the same charter flight as I was, traveling to and from the GoDaddy Bowl, not 11 days earlier! We spent more time talking about the football game than the race. So, the time had come to pack everything, hitch the boat up to the truck, and head back to Toledo. As you might imagine, Key West can be cramped and full of tight corners, which isn’t an ideal place to be pulling a 33-foot boat, so we were being extra careful navigating around some closed streets. As we hit the A1A, right next to the ocean on the south side of the island, we pulled over for a routine check of the trailer lights. That’s when the first Key West patrol car pulled up. It was eventually joined by four more. As we were told by the first officer, we were being pulled over for hit and run — on another police car. Oops. Unknowingly, we scratched the front bumper of a patrol car with the trailer’s license plate while turning one of the many corners. After the officer in question arrived, we went to look at the damage and talk to him about what had happened. This was when I learned that the universe truly does have a warped sense of humor. As luck would have it, we quite literally ran into another UT alum. 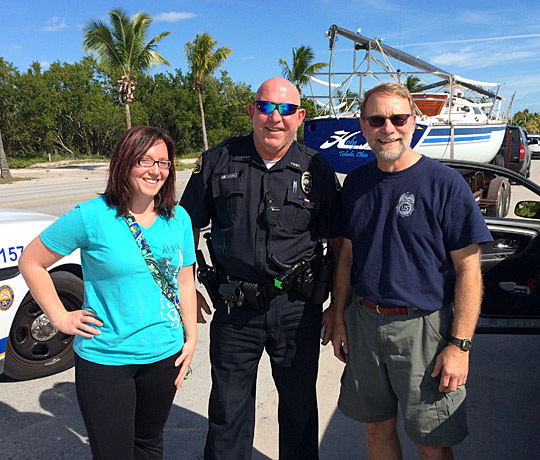 Key West Officer Bob Bulnes told us how surprised and amused he was when he saw the name of the boat. (Not amused enough to help us evade a ticket for failure to maintain lane, though.) 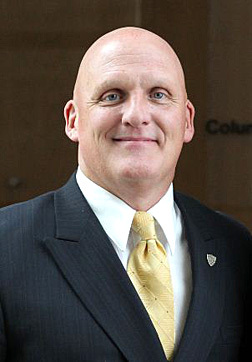 Just being an alum wasn’t enough; he was actually a tight end for The University of Toledo’s football team from 1979 to 1981, and he finished his athletic career with a Rocket victory in the California Bowl. Despite living in the city that claims the southernmost point in the country, Bulnes said he makes a special trip back up to Ohio every year for the Bowling Green game, and he still keeps in contact with former Head Coach Chuck Stobart. Miller is photographer 2 at the University.